Wisdom of Life. 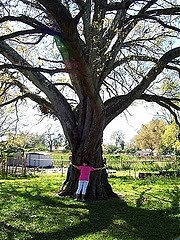 : Hug a tree for energy! Do u feel down, not wanted, no love, no energy, no inspiration? Try hugging a tree. Rinnie is one friend I just got to know. She is pretty and intelligence but because of a bad marriage broke up, she isn't ready to fall in love so fast again. She is handling two jobs a day and need to care for her four years old daughter as well. By the time she goes home late, she would be dead tired and exhausted. She cries to have a man who could love her sincerely but being a strong headed lady, she chooses to be independence for the time being. I asked her how she could overcome the need for love. She said...."I hug tree whenever I am down!!!" 1. To really experience a tree, Hug it!!! 2. Just hug it for fifteen minutes or more and feel the flow of life energy in the tree, in yourself, and between you and the tree's. 3. You should be aware of what you are feeling in your body while you are hugging the tree. Let your awareness flow up and down through your body as you are doing this exercise. *Remember, the life energy can feel the same as sexual energy. 4. Keep hugging until you feel a difference in your energy. Note what the difference in feeling is. 5. Turn your back to the tree and lean against until you feel the energy shift. Be aware of how the shift feels. 6. Thank the tree and leave an offering. **Note**It is a gift both to and from spirit to embrace a tree. Another great gift to a tree is to dance and frolic around its base letting the earth energy flow from the tree's roots into your being and letting your joy and energy flow up into the branches of the tree. This cycle of joy can renew both you and the tree spirit. If a tree is very strong and you are a climber, you can climb the tree and cuddle up in its branches. Once you have experienced the energy of one tree you might try the same exercise with other trees, with bushes, shrubs and herbs! You have your whole life to finish doing these exercises. Notice that different trees evoke different feelings in you. You can begin to learn some of the healing properties of trees and other plants if you can sincerely focus on these feelings! So! You need a partner or a tree. Thanks God! I have my little darling...I certainly prefer to hug her more than anything else. Internal energy needs to be released somehow, it doesnt matter how u do it for as long as it is "safe" and not troublesome. True! I still prefer to hug my little darling more who is warm and loving.